If you follow me on instagram you’re probably bored of me teasing you with pictures of this quilt buuuut it’s all done now so here it is with our resident newborn model, Kermit the Frog! I put Kermit on it for scale so you can see that I accidentally made it totally massive (42 x 52 inches). Oh well, the baby can use it until it’s old enough for sleepovers, plus it’s a nice size for using as a lap quilt on the sofa (as I discovered when I was hand finishing the binding in front of the TV this week!). This quilt is for the same baby that got those little trousers a few weeks ago. The baby will be a Pisces like me, so (even though I don’t really believe in horoscopes), I thought this mix of sea on the front and stars would on the back would suit the little one. 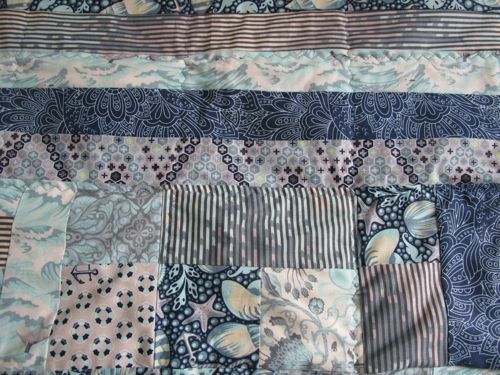 The salt water fabrics that I used for the top are so much fun, with all manner of sea creatures (and submarines!) hiding in the patterns. I made up the pattern on the top as I went along. It was nice to take a lot more risks with quilt, compared to the last baby quilt I made where I was quite “safe” with my fabric choices and the pattern. I started from the top with full stripes of all the different fabrics, and then worked in strips down from there, epiecing the fabrics together. I started with some bits precut, but in the end I was just cutting the fabric and playing with it like a jigsaw and then sewing it together. It was fun! One thing I learnt was that some of the fabrics that I wasn’t that fond of when they arrived (like the stripes), actually looked sooo good once they were cut up into little pieces and up against other patterns. I ordered the fabrics online and when the arrived I was a bit worried that the two different hues of blue on the front and back didn’t really go…. But once it the top was all sewn up I took into into my local quilt shop with the backing fabric and spent my lunch break browsing fabrics. Once I found this beautiful yellow the two blues really started to sing and I fell in love. Here’s one of my favourite bits! I had this seagull ribbon in my stash and at first I just sewed it into the binding, but then I figured it would be nice to reinforce it so that the baby’s mum (my friend) could use it to hang the quilt up on a hook if need be. Here’s a better view of the backing fabric with all its funny constellations. I quilted it with a triple zig zag stitch on my machine for some more wavy-ness. I wasn’t thrilled with the way this turned out (I have got to figure out how to work the walking foot I got for Christmas! ), but I think it works. I attached the binding using the machine for one side and then secretly hand stitching on the other. I did all this using yellow thread that matched the binding, but as I was doing the hand stitching, I realised that I should have matched the machine thread to the quilt not the binding, so that it would be less visible if any bits did stick out of the binding. Front: six skinny quarters of various Salt Water by Tula Pink fabrics in the ‘aqua’ colourway from the Village Haberdashery (I emailled Annie the shop owner and she cut them skinny not fat for me so that I could do the long stripes at one end of the quilt). Batting: Bamboo Blend 50/50 bamboo cotton batting (I bought this off a roll at my local quilt shop though). Time: Started after work last Wednesday, finished Tuesday lunchtime. Two solid evenings and a Saturday morning, the rest in bits and pieces. Let’s finish this up with one more picture of our beautiful baby all wrapped up! This entry was posted in Parties and presents, sew sew and tagged Crafts, home, life, presents, projects, quilting, Sewing, sewing for baby on March 6, 2013 by Annabel Vita Admin. Here’s a short and sweet post for a short and sweet project. Kermit loves modelling, and he’s so good at it too. The first of my close friends is due next month and we are all SO EXCITED, yet also a little unprepared because we’ve never done this before! I plan on making the baby a baby quilt, but when one of her friends organised her a last minute baby shower dinner thing, I wanted a quick project to give her (the quilt won’t be finished till the baby is born). So I turned to my pins and found this lovely free pattern from Made by Rae and got to serging (oh yeah! 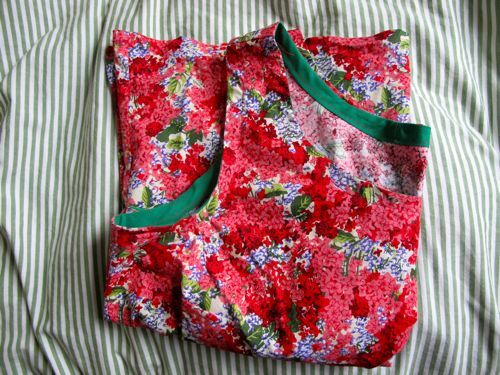 I did all the guts of these on my new overlocker). I was going to just make them unlined in this black and white elephant fabric, buuuut then after cutting them out and sewing them up, I realised I had cut the elephants out upside down. Ruh-roh. So I pulled out my copy of Anna Maria Horner’s Handmade Beginnings and copied the construction of her quick change trousers to make a these into lined pair of trousers. To do this, you make two identical pairs of trousers and sew everything except the waistband and leg openings. Then slip one pair into the other, right sides facing. 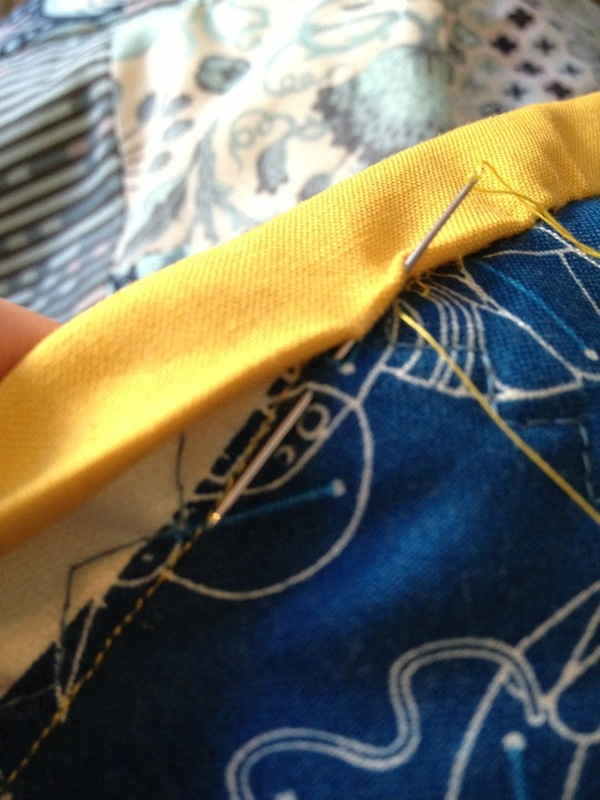 Sew a seam along the top of both pairs of trousers. Turn inside out, then top stitch about half an inch under the waist band, leaving a small opening to slip quarter inch elastic through. Thread the elastic through and then zig zag stitch the ends of the elastic together and complete the top stitching so it looks all nice. I didn’t take any pictures of this but thankfully I used horribly clashing thread for the top stitching so you should be able to figure it out…. Once you’ve turn that, turn all four leg openings up quarter of an inch with the iron and top stitch all the way around. You’re done! And those upside down elephants on the inside? Perfect turn ups! This post is part of the Pinterest Challenge, organised by Katie (Bower Power), Sherry (Young House Love), Michelle (Decor and the Dog), and Megan (The Remodeled Life). 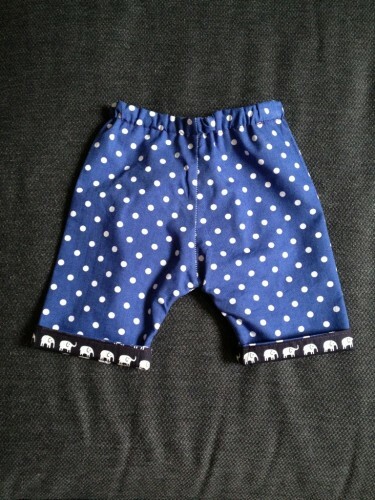 This entry was posted in Parties and presents, sew sew, Uncategorized and tagged baby sewing, Brother 1034d, Crafts, pinterest challenge, sewing for baby on February 27, 2013 by Annabel Vita Admin. Happy new year, team! I hope everyone had a jolly Christmas and a spendid New Year. We had a lovely Christmas at Mr V’s parents’ house with the whole family and then we whipped down to Devon to welcome the new year with my friends. We swam here on the 1st of January to wash the old year away! It was frrrrrreezing, unsurprisingly. Anyway, I thought I’d just update with some Christmas sewing I did for the tiny nieces and for the homemade secret santa that we do at New Year. First up, I made our toddler niece a dress with elephants on it. It’s the Every Little Thing Dress pattern from Schwin Designs, which I bought in their Black Friday sale. Not going to lie, I pretty much hated sewing this dress. My sewing machine kept ripping thread, my gathering kept messing up, my iron got dirt on the white bit of dress… basically everything that could go wrong, did go wrong! (And most of the things that did go wrong, were my fault either that day or at some point in the past.) Eventually I called it a day, whapped some polka dot bias tape on it to cover some sins and accepted how wonky these elephants are on the back. I was a bit aware that making clothes for babies and toddlers is more of a present for their parents than the kid themselves, so I wanted to make a simple softie to match the outfits I’d made (the baby niece got these polka dot dungarees). So, using this Little Softies Zoo Pattern (amazing, so well designed and written!) I made big and little elephants in the same fabrics. I was happier with how the baby elephant turned out. It really felt like I was short changing the toddler niece as I wasn’t happy with her dress or elephant and I was thrilled with her baby sister’s dungarees and elephant. Oh well, luckily she’s only two so she didn’t care! I didn’t have much time to make my present for homemade secret santa so I decided to stick with the Little Softies pattern, adding a giraffe to the mix. I made them out of lovely printed felt and did a bit more embroidery on them (as they were for an adult). I still realised that I’d essentially made a 29-year-old a baby toy, but she seemed to like them! I only managed to snap a picture of these with the iphone after I’d given them, so sorry there’s not much detail. So that’s the last of my pre-Christmas sewing all caught up! Homemade secret santa marked one year since my first sewing project since school (pyjama cat). It’s been really fun – I’ve loved learning so much and nothing beats the feeling of making a whole new thing out of fabric and thread. I’m looking forward to sewing a lot more in 2013. I’m also hoping to get a lot more technically proficient and make many more wearable garments. Making the felt elephant also ignited a new love – hand embroidery – so there might be a bit of that too! Did you make any Christmas presents this year? I wanted to make more but ran way out of time (I owe Mr V some pyjama shorts!). Next time I’ll start earlier, because I’ve missed my selfish sewing. This entry was posted in Parties and presents, sew sew, trips and tagged Crafts, life, projects, sewing for baby, Softies on January 7, 2013 by Annabel Vita Admin. 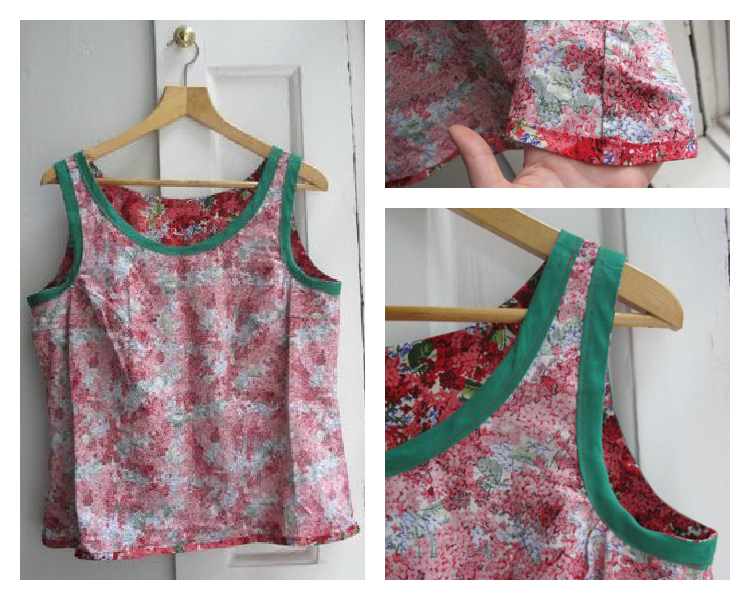 Are you bored of hearing about sorbetto tops I’ve made yet? Too bad, because I’m not bored of making them! This one was actually made out of necessity though – I have lots of cardigans and jumpers (sweaters!) that just don’t work with any tops that I own, normally because the neckline or sleeves were wrong. 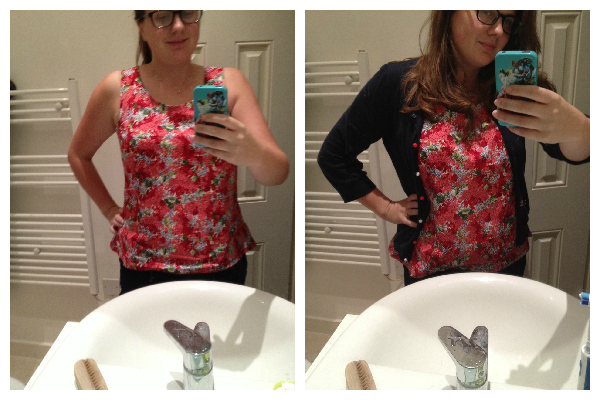 I decided a nice wide necked sleeveless tank would fit the bill and luckily I knew just the pattern! Front/Back – should’ve ironed it. I won’t go into too many details. I omitted the pleat because this print was so busy I thought plain would be best. The fabric is some type of cotton (I think) and I made it much the same as my Sorbetto dress, but I only added a few inches to the bottom rather than, you know, a skirt. With apologies for my dorky face and the silly mirror picture. Yup, definitely should’ve ironed it. You can see my rookie dart addition in the bottom right picture. I love the way this top looks from the inside! I french seamed the sides and did a small double fold hem. My bias facing is so much neater than it was on the sorbetto dress (see for yourself there! ), so if I wanted to next time I could put the facing on the outside. I really trimmed the seam allowances (with pinking shears) on the neck facing in particular and it really made a difference, so I’ll be doing on the armholes too next time (tip from this great post ). This dress fits differently to the two other versions of this pattern I’ve made (first one is here). It’s a lot roomier – there was so much excess at the armholes when I tried it on before binding that I added an armhole dart (that sounds complicated and like I know what I’m doing– I just pinched and pinned the excess while wearing it and then sewed along that line). I don’t think I cut inaccurately, so it’s probably just because this fabric highlighted the excess (it’s stiff-ish), but it seems a bit bigger all over. We’ll see. This fabric cost me £5 at the beginning of the summer (I bought a metre and have scraps left for wedding bunting). I think the bias tape was about £2. The pattern was free. I started printing the pattern (I tore my old one) at 1pm on Sunday, and by 5pm I was completely finished. I think about an hour of that was assembling the pattern (I did it slowly because I was watching the Sopranos at the same time) and I also stopped for lunch. I hope next time will be quicker still. This entry was posted in sew sew and tagged Bias tape, Colette Sorbetto, Crafts, fashion, Sewing on October 24, 2012 by Annabel Vita Admin.